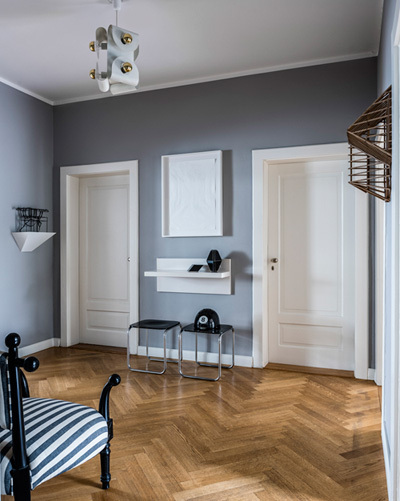 The office of Tredup Design.Interiors, an interior design firm in Munich, is brainchild of the principal in the company, Ulrich Tredup. An expertise in the aesthetic elements of design and the technical expertise of interior architectural applications creates a dynamic service-oriented business. The projects are balanced between residential and commercial, complete design and construction to renovations and restorations as well as "make overs" and expansions. The experience of Tredup encompasses all aspects of design as well as execution and management and encompasses a decade of application of his expertise. The introduction of affiliate experts and staff allows for unlimited scope and size as well as simultaneous work and a variety of projects. Detailed control of costs and construction timelines is a value-added service of the firm and allows for complete project management. The office is centrally-located in Munich and has contacts and introduction to a large array of international suppliers, manufacturers and experts (e.g., upholstery, fixture manufacture, custom colour and lighting, etc.). Die Tätigkeit von tredup Design.Interios umfaßt die individuelle Innenraumgestaltung von Läden/Geschäften, Büros, Praxen, Restaurants/Cafés Privathäusern und -wohnungen im In- und Ausland, den Entwurf von exklusiven Möbelstücken sowie die Planung von Neu- und Umbauten (u.a. bei denkmalgeschützten Objekten). tredup Design.Interios bietet sämtliche Leistungsphasen nach HOAI (Honorarordnung für Architekten und Ingenieure) für Raumbildende Ausbauten: Grundlagenermittlung, (Vor-) Entwurf, Genehmigungs- und Ausführungsplanung, Ausschreibung, Vergabe, Objektüberwachung (Bauleitung) u.a.